In our study of oscillating systems, we shall have occasion to use one of the most remarkable, almost astounding, formulas in all of mathematics. From the physicists’ point of view, we could bring forth this formula in two minutes or so and be done with it. But science is as much for intellectual enjoyment as for practical utility, so instead of just spending a few minutes, we shall surround the jewel by its proper setting in the grand design of that branch of mathematics called elementary algebra. The number 0, the additive identity. The number 1, the multiplicative identity. The number , the base of natural logarithms, which occurs widely in mathematical and scientific analysis ( = 2.718281828…); both and are transcendental numbers. The number , the imaginary unit of the complex numbers, whose study leads to deeper insights into many areas of algebra and calculus. for any real number . The derivation to the identity follows, as and . Euler’s Identity reinforces the underlying beauty and interconnectedness of mathematics, pulling together three seemingly disparate areas into one simple formula, perhaps deservingly being known as “the most remarkable formula in all of mathematics“. Previous: I’m a Scientist, Get me out of here! I definitely agree. If I ever win the chance to have a tattoo after inadvertently coming first in a spitting contest (or however it is that people with tattoos come by them), I shall choose this formula. 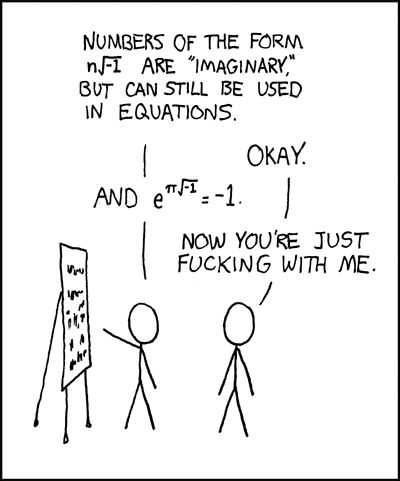 Another interesting fact that comes out of the Euler relation is the fact that i^i is a real number. I cannot decide if that happens to be mind boggling, unsurprising or useless. I’ll be a dissenter here. I prefer the related e^(2pi*i)=1. True, but I suppose you can generalise to : it gives 1 for even , and -1 for odd (each increment of takes you halfway around the unit circle). Also, big fan of what Wolfram Alpha produces for this. I remember the steps from this area on to differentiating and integrating hyperbolic functions, and then realising that an extraordinary number of identities drop out as if by magic: hyperbolic correspondences to trigonometric correspondences (cos^2 + sin^2 = 1, for example) seemed like mind-boggling witchcraft the first time I saw them, and then afterwards, seemed amazingly simple. Gentlemen, that is surely true, it is absolutely paradoxical; we cannot understand it, and we don’t know what it means. But we have proved it, and therefore we know it must be the truth. I wrote a blog post about understanding Euler’s equation: http://wordpress.MrReid.org/2012/07/25/understanding-eulers-identity/.